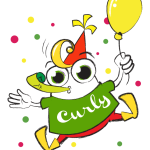 Many of the 1st birthday party games on this page have been graciously submitted by visitors like yourself. If you’ve got any cool ideas to add just scroll to the bottom of the page and share them with us, Thanks! Get the kids to sit in a circle and ask each child to find something in the room with a certain color. They can then individually go get their object and bring them back to the circle to share. For this game scatter a whole bag of cotton balls in the party area. Then have the kids see who can collect the most ‘clouds’. If you don’t want it to be competitive, just tell the kids that they need to collect the clouds and put them all in the middle of the room together in order to create a big cloud (all the cotton balls put together). Cut out large circles of the primary colors. Then cut out smaller circles of all different colors. Let the children match the colors and match which colors make up the smaller dots (for instance, put a green dot in either blue or yellow). This can be a funny game for the adults and the youngsters. Have a relay where each person has to tilt their head back and put a skittle on their nose. Then they have to walk forward until they reach a bucket and lean their head forward to get their skittle in the bucket. This is a fun and creative game for the Rainbow first birthday idea. Get an empty egg carton and twelve small rocks that fit in the eggcups. Paint the rocks and corresponding sections of the egg carton with various colors. When the rocks have dried, hide them around the party area. Write down clues on colored papers (corresponding to the rock that’s to be found) and have the kids hunt for the rocks and match them to the correct sections of the egg carton. At the end the kids’ll find a pot full of gold chocolate coins that everyone can share.